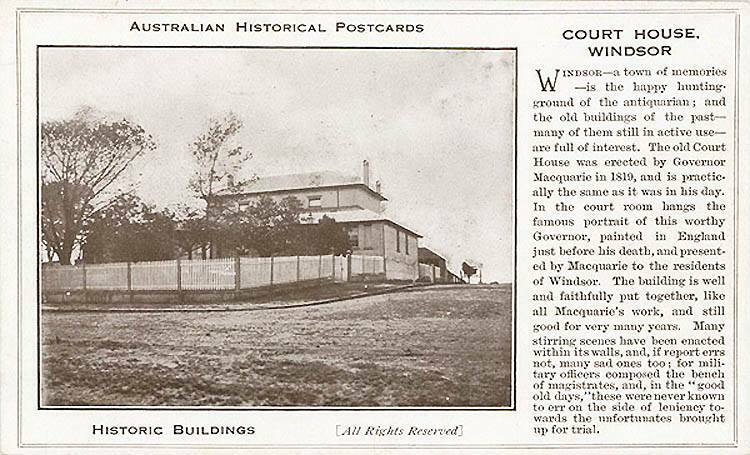 It being the intention of His Excellency Governor Macquarie to erect a new Court House at Windsor, such person or persons disposed to build the same by contract are requested to send in sealed Tenders to the Chief Engineers Office, in His Majesty’s Lumber Yard on or before 15th May next. The Plan of the Court House with the Specifications, may be seen at the Office. Thus it was that the wheels were set turning to build Windsor a new Court House which remains today the oldest existing local court in NSW. The winning tender was put by the Hawkesbury’s own William Cox and in 1822, the building’s architect, Francis Howard Greenway, applied for permission to go to Windsor to inspect the construction. Francis Greenway is considered as Australia’s first recognised architect and he designed two of his most iconic and famous buildings for Windsor – the Court House and St Matthew’s Church of England. Greenway was born near Bristol, England in 1777 and was descended from a long line of architects, stonemasons and builders. While practising as an architect in Bristol and Bath he became bankrupt and was convicted of forging a document. He was sentenced to death but this was changed to transportation to NSW for 14 years. 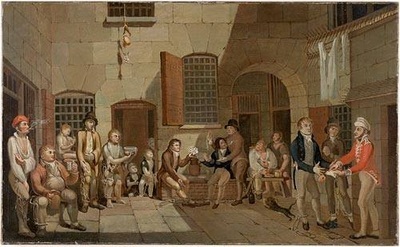 Whilst incarcerated in Bristol’s Newgate Prison, Greenway made two illustrations of his situation, which have come down to us. The year was 1812 and he was 35 years old. He arrived in Sydney on the General Hewitt in 1814 , bringing with him letters of recommendation and a portfolio which he sent to Governor Macquarie. He was almost immediately granted a ticket-of-leave which enabled him to seek his own work to support wife Mary and 3 children, William, Charles and Francis who followed in the same year aboard the Broxbornebury. (Also travelling on-board was Jeffrey Hart Bent, Barrister at Law who was appointed Chief Justice in the Colony – he wrote a “Journal of the Voyage”, now available on Google Books.) In December 1814 Greenway advertised his architectural services in the Sydney Gazette. By lucky chance, while he had been working in Bath, Greenway had become friendly with none other than ex. Governor Arthur Phillip who was living in retirement in that town. Phillip wrote to Governor Macquarie recommending Greenway to him. Greenway’s buildings provide the the iconic symbols of Macquarie’s governorship. Recognising Greenway’s skill in designing a building that was appropriate for it’s setting, whether rural or metropolitan, Governor Macquarie’s support for Greenway provided the atmosphere through which Greenway’s talents could excel. Elizabeth Macquarie had a great interest in architecture and her library of books on that subject were used by Greenway the Macquarie’s in their plans to create a well planned city with substantial and aesthetically pleasing public buildings. Hardy Wilson ( “Artists of the Square”- series – CAWB FB ) who came to Windsor to make drawings for his historic publication “Old Colonial Architecture of NSW and Tasmania”, regarded him as Australia’s finest architect and as an architect who made an “art” of the profession. 1819 marked the turning point in Greenway’s career. He was an important citizen but his arrogance made him misjudge his authority. He made many enemies and he now fell out with Macquarie. The arrival of Commissioner John Thomas Bigge saw many of Greenway’s buildings scaled down as Bigge thought his projects too extravagant. Greenway was not politically astute and was only concerned with spoiling of his designs. Greenway’s position became impossible when he billed the Government for fees of 11,000 Pounds for buildings he had designed for the government when an employee of the Government. Greenway paid the price of “injuring the government and therefore the public” when he made these outrageous claims to the government for costs incurred and was dismissed in 1822. His professional life ended in 1828 with the completion of Robert Campbell’s House in Bligh Street, Sydney. Greenway took up his land grant at Tarro,on the Hunter River and appears to have come upon hard financial times. He died Sept. 1837 ( aged 59) of typhoid fever. He is buried in Glebe Cemetery,in a lonely paddock outside East Maitland. There is no tombstone or marker over his grave. When we consider Greenway’s connections to Windsor we obviously think of his two great buildings which still stand in cherished good order in our district – St Matthew’s Church of England and the Court House. 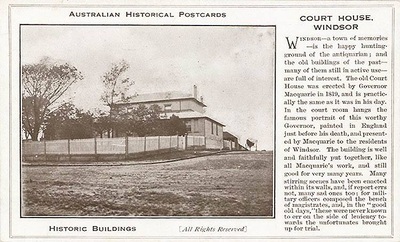 The last building which Greenway and Macquarie supervised in their old spirit of amicability was Windsor Court House. Though only a minor building, it is beautifully restored and preserved and is the nearest approach to a complete Greenway design that has survived. It came in at a cost of 1,800 Pounds, compared to St Matthew’s which cost 5,600 Pounds. But Greenway also did other things here in the Hawkesbury. From the Australian Almanac, 1835 – “When the wharf at Windsor, built by Mr J. Howe, was washed away and Howe’s bridge in danger from the same cause, Mr Greenway was directed by the Governor to survey the place, and to finish the plan of a wharf on a more secure principal, and also a plan whereby the bridge might be secured. The new wharf was built; and though not by any means on so efficient a plan as the one proposed, yet it has since stood the effects of some of the greatest floods.....The government however, neglected to secure the bridge according to the architect’s instructions and the result is that it has been washed away. Plans were also furnished for a church and parsonage-house, a court house, a barracks, a store and many other improvements.” Greenway also did some survey work on looking for an appropriate place for a bridge over the Hawkesbury.